The "Cadillac" of our Reformer line, the V2 Max Plus� Reformer facilitates limitless exercise possibilities. 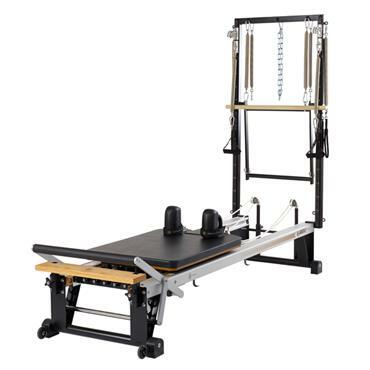 This one-of-a kind unit multi-tasks as a raised Mat platform, a standard reformer, a virtual Cadillac and a breakthrough multi-planar, biomechanics training tool. Equipped with our innovative retractable rope system and travelling pulleys on the vertical frame, the V2 Max Plus offers variable angles of resistance, providing an increase range of motion, making it the premier tool for Pilates-based sport-specific, rehab and cross-training movement. Vertical frame equipped with 2 push-thru springs, 2 roll-down springs with maple roll-down bar, 2 arm springs with foam grip handles, 2 leg springs with padded long spine straps, 2 extension straps, 2 traveling spring hooks, 2 traveling pulleys and a safety chain. Patented Retractable Rope System � make changing rope lengths a breeze!